Ireland received $46bn (€33bn) in foreign direct investment (FDI) last year, placing it 10th in the rankings of the highest recipients. That's one spot higher than it reached in 2012 and makes it the second-biggest recipient of FDI in the EU after the UK. Global foreign direct investment (FDI) inflows rose by 11pc in 2013, to an estimated $1.46 trillion (€1trn) – a level comparable to the pre-crisis average, according to the United Nations Conference on Trade and Development (UNCTAD) think tank. FDI flows to developing economies reached a new high of $759bn last year, accounting for 52pc of global FDI inflows in 2013. The US was the biggest recipient of FDI last year, accounting for $159bn of the global total. China was second with $127bn, while Russia was third with $94bn. The British Virgin Islands – a brass plate destination of choice for global companies that often use it for treasury functions – was the fourth biggest recipient of FDI last year, attracting $92bn. But most of the money injected into the Caribbean island is quickly transferred out again through treasury accounts of large firms. 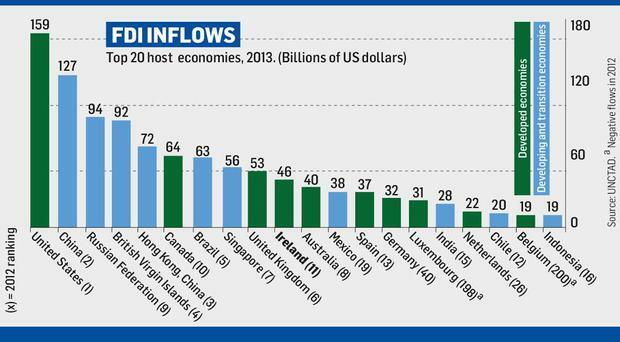 Ireland lagged behind the UK, which received $53bn in FDI last year. However, the UK's ninth spot on the rankings is down from sixth in 2012. Spain was the third-biggest EU recipient of FDI, attracting $37bn, with Luxembourg next at $31bn.